Review by AllTheBestFights.com: 2015-12-12, nice grappling exchanges between Demian Maia and Gunnar Nelson: this fight gets three stars. The black belt in Bjj Demian Maia entered this fight with a professional record of 21-6-0 (62% finishing rate) and he is ranked as the No.7 welterweight in the world (currently the #1 in this division is Robbie Lawler). He suffered two consecutive defeats between 2013 and 2014, against Jake Shields (=Maia vs Shields) and Rory MacDonald (=MacDonald vs Maia), but then he has won three bouts beating Neil Magny in his last one. His opponent, the black belt in Brazilian jiu-jitsu and karate Gunnar Nelson, has a mma record of 14-1-1 (93% finishing rate) and he entered as the No.19 in the same weight class. He suffered his only loss last year, against Rick Story (via split decision, Nelson vs Story), but he came back to win in 2015 defeating Brandon Thatch (=Nelson vs Thatch). 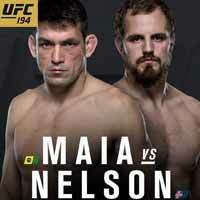 Maia vs Nelson is on the undercard of Jose Aldo vs Conor McGregor – UFC 194. Watch the video and rate this fight!